Unlike southern country hams that you can enjoy without cooking, these are the kind that most of us—at least those of us from the North—are used to eating. They're the ones you put in the oven to reheat, sometimes pinned with pineapple slices. Skip the pineapple here, these hams don’t need it. The hogs include a mix of heritage breeds, like Yorkshire, Hampshire, Berkshire, and Duroc. They are raised in the Midwest on small family farms, and they're never given antibiotics or hormones. The meat mavens at Smoking Goose in Indianapolis, IN, cure the hams with clove, juniper, bay leaves, and garlic. Then they smoke the hams over a mix of applewood, cherrywood, and hickory for eight hours. 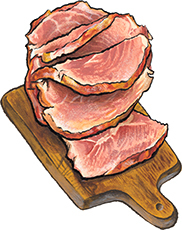 The hams are juicy, full of flavor, and easy to enjoy. Just heat, slice and eat. Shipped frozen, may arrive frozen and need a day to defrost.